As a pioneer in glycomics and glycan analysis methodologies, S-BIO offers our partners access to a proprietary, high-throughput solution that is compatible with complex biological samples and can deliver both qualitative and quantitative data on N-linked and O-linked glycans. 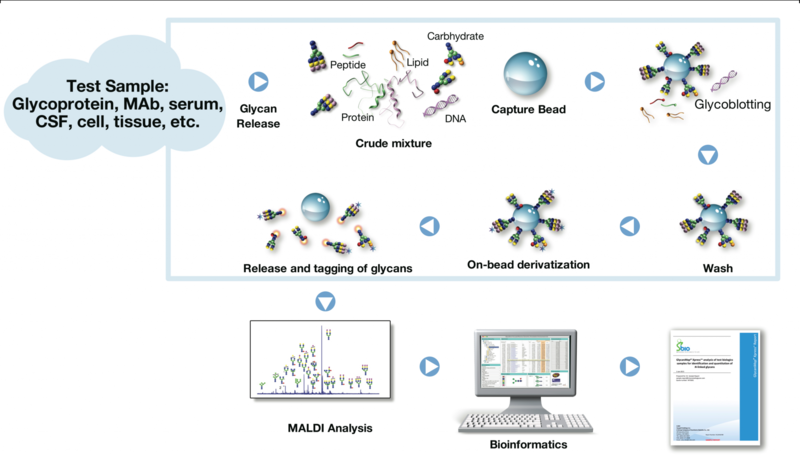 The GlycanMap® platform, S-BIO’s proprietary core technology, combines a bead-based separation technology and fully-automated sample processing with high-throughput MALDI mass spectrometry and robust bioinformatics capabilities to generate rapid, reproducible glycan structural profiles. S-BIO uses glycoblotting technology, which is faster and easier than conventional methods. This rapid chemoselective process features an “all-in-one” bead-based platform technology that enriches oligosaccharides from crude mixtures, enabling highly selective and high-throughput purification of oligosaccharides from biological samples such as serum, CSF, tissue or cell lysates, and cell culture media. Results are proven comparable to standard lower-throughput methods. Our customized 96-well robotics system provides the throughput and repeatability required for large-scale glycomics studies, facilitating analysis of hundreds of samples for process development and robust biomarker discovery. S-BIO employs a unique and proprietary protocol that, in combination with MALDI mass spectrometry, enables glycan identification and quantitation with reproducibility comparable to HPLC, yet at a far greater throughput. High-resolution mass spectrometry provides accurate glycan identification, with sumultaneous detection of both neutral and acidic oligosaccharides, including sialic acids. Proprietary bioinformatics provide absolute quantitation by comparing peak intensities to those of internal standards. In addition to our core GlycanMap® technology, S-BIO also has a full suite of assay development and glycan and protein characterization capabilities, including LC, LC/MS, MSn, glycopeptide analysis, and protein analysis.